Five months old and she just has made me so happy! 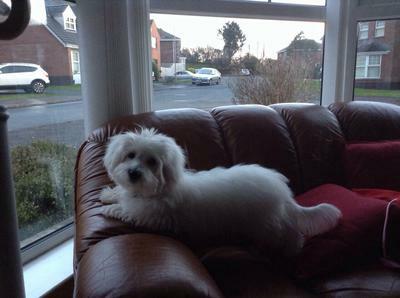 I love my Coton! Comments for Belle The Beauty! You are just adorable Belle! I think we all love our little coton babies. Love your pic! What a lovely dog. She looks really sweet and loving on top of being a cute coton. These wee dogs are amazing. My one (Slipper stealer Spike) is so friendly to everyone that they all fall in love with him. Time consuming, hard work, expensive but worth it all 10 times over!! Yes she is so Belle! Very Belle natured too! Oh my. She is so very beautiful. Perfect name. They do seem like the perfect dog to me. We have a Coton and a Havanese. Both awesome little dogs.